At WetCanvas, in the Western Forum, we have an annual art swap, where artists have the opportunity to trade one of their artworks with a fellow artist friend. It’s a great tradition and so much fun! Today is our “Big Reveal” day, where we all share our works. – 5×7 inches in size, on an Ampersand scratchboard. – I used just the #11 X-Acto blade for this, as well as black ink to correct mistakes and touch up. 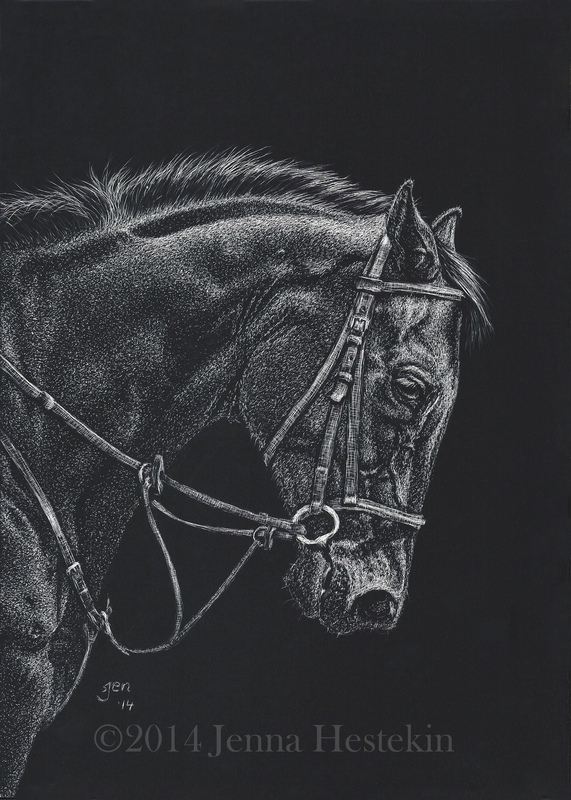 The beauty of Scratchboard is its simplicity and relatively few tools. Oh Jenna, this is absolutely fabulous! Your scratchboard just gets better and better! Thanks, Kathy! It means a lot to hear that. Scratchboard, as with anything, tends to improve with practice. 🙂 Thanks again! Thanks so much, O.G.B.! (It’s Bree, right? 🙂 ) I appreciate the comment.